God bless all of you. It has been a very long time as my YouTube channel (praise God) has increased by the thousands per week. I wanted to leave you with this latest update to let you know how close we are to the end of this age. Jesus is coming soon! Please follow the link I am providing here to you..this is very important! God bless all of you! Jesus predicted in the Olivet Discourse that a pronounced increase in the frequency and intensity of earthquakes would occur just prior to His return to the earth. Now if you live in the Pacific Northwest, you might want to consider moving after seeing the new scientific report which predicts that a mega-earthquake will kill thousands and destroy a sizable portion of the Pacific Northwest. Even more disturbing? It’s overdue. Could this be a Luciferian geoengineered fulfillment of an apocalyptic prophecy? I agree with you, Lyn. God bless and take care. Looney Lyn the false prophet doesn’t even have the decency to communicate on her own page. Charlatan! why would she reply to anybody who is childish enough to call her names? I wouldn’t either. This is the reason why America needs to make President Trump God so the lives of us will reach Christ better spiritually in Heaven. Trump is our Good Concordance to the Original Hebrew and Greek Bible Manuscripts. Prayer is not enough. You need Trump and Pence along with Bush and Kavanaugh to reach Christ in Heaven better spiritually. You dig? Good, because it is proven true in our church here in Gaithersburg, Maryland. Study the Good Holy Republican Christian Donald Trump Gospels and you will learn of the Good Republican Jesus Christ Gospels far better! I guarantee that Christ will work well through Trump in improving America! You’re a pharisee, spreading lies and falsehoods for profit. Enjoy your stay in hell. Christ’s church is orthodox church . orthodox christianity is true Chrsitianity. Here are the things that the lord laid upon my heart to write.for the necessity of life is god . for god is the necessity of everlasting peace .for peace of mine is a necessity of live be at peace of mine with god . and wind you are weary and tired have patience in your discomfort for who has gained by dismaysment for your lord will give you rest .for his comfort is great .and he in the passing by and there for all to see came he that grown within all that believes . for man can only spread the news throughout the whole land .to pronounce the king of the Jews.prepare your selves the pride of man is coming soon .you known me not saith the lord prepare your self’s for my wrath is upon you be among you tolerance and there be for me you have defiled me . 1) The Weather Channel, Fox News, and “all major news networks” recycled The New Yorker piece, so in truth you have a SINGLE report about “the big one,” not multiple. Unless you’re counting my great-Uncle Ted, who’s been prophesying earthquakes for a while now. Have you met great-Uncle Ted? You probably haven’t forgotten, what with him so ripe with the stench of parsnips and all. 2) Your headline is misleading. No one (of any repute, anyway) has “confirmed” anything. The effects of a massive earthquake on the Pacific Coast remains conjecture until after the event. Possibility is not probability, and even probability isn’t guaranteed. Likelihood of a massive earthquake is still guesswork, thus voiding the sensational “soon” in your headline. 3) Furthermore, news of “the big one” isn’t news. Seismologists have been speculating on massive earthquakes in the Pacific and along the coast for decades. Although I do look forward to your next report: THINGS AND STUFF HAPPENING RIGHT NOW, OTHER THINGS AND STUFF TO FOLLOW! 5) If you’re confident in your prophecy, why rely on mainstream media’s support for your position? Either you believe and mainstream media doesn’t matter, or mainstream media isn’t *quite* the wicked outlet for Lucifer that you claim and maybe, just maybe, you don’t have enough faith. Shame on you, Lyn, for not having enough faith. I expect better from Christians spewing hyper-lunatic conspiracies that tarnish and obscure the true work of God’s Kingdom. One thing to keep in mind is that most people and/or Christians living in the Northwest, as well as much of the West Coast don’t have the means to “escape.” So warning them is all that we can really do. Repent, and seek God! That is all! Love ya Lyn! At my church in Gaithersburg, Maryland many of my parishoners soon got baptized in the Good Holy Gospels of Republican Donald Trump and Republican Jesus Christ Together for a synergistic spiritual benefit and that is Good News Gospel of Trump and Christ working together for America. Don’t you agree? Proven true in our church today! Hi Lyn-i just love listening to your voice-it is soothing to me even tho you talking about my beautiful home here in the pacific northwest-please pray for us here that cannot afford to just get up & move-times are so tight we can barely put groceries on the table let alone prep-God Bless You!!! Love your channel. The image you use of Vancouver is extremely bad journalism and bad science. No wave that big could be caused by an earthquake ANYWHERE. For a wave that big (400 feet) to hit Vancouver the only realistic cause would be a meteor strike in close proximity, Strait of Georgia. 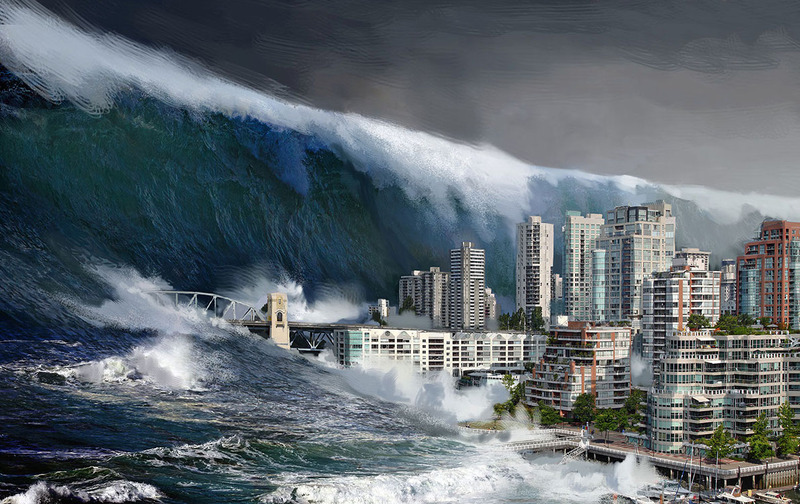 Worst case scenario for a tsunami wave from a megathrust earthquake in Cascadia is 100 feet, and that’s on the continental coast, not inland in places like Vancouver and Seattle. I have become a Christian at the Church of Donald Trump and His Holy Spirit Gospels at the Whitehouse and Trumptowers so that Christ will come down from Heaven in spirit. Hillary Clinton and Barack Obama need to make Trump God so their lives will reach Christ up in Heaven spiritually because Trump is a Good Republican Christian President working for Christ and the Christians here on earth. Call Debra Alfarone and Peggy Fox on WUSA9 News at 202-895-5999 for details on how to use the Good Holy Republican Trump Gospels to reach Christ in Heaven spiritually. Thank you for your service! Good work Anne Krakowsky for you are a new creature in Trump and Christ together. Prayer is not enough. You need a concordance such as Trump to reach Christ spiritually in Heaven. I am glad that you are on the right path to Holiness and Heaven! ARE! TRY INTERPRETING THESE SIGNS THE RIGHT WAY! TRY ALSO DECODE THE BIBLE & THE KORAN FOR GETTING FILTERED OR MERGED / MERGEABLE INFORMATION! With Trump being our good Christian Republican president, He through Christ will tell the waves to calm down and be quiet and they will as Trump has Christ’s Holy Spirit in Him. We thank Leslie Foster of WUSA9 News for worshipping and praising president Trump and Christ together for a better spiritual benefit! Our Chicago Bible students traveled around the world to mention that Franklin Graham needed President Trump to be Personal Lord of the world so that he will be able to deal with his dad’s being deceased. Graham mentioned to the students at the Cove in Asheville, North Carolina that “WE NEED TO MAKE TRUMP GOD SO THAT OUR LIVES WILL BE LIKE BILLY GRAHAM AND HEAVEN” and he made a good point. Call our church school at 1-800-463-7752 for details on this good Gospel Plan! We want to thank you for your service! Greenway Plaza area at 3700 Southwest Freeway.